Study of brainwave activity during different sleep stages, as measured with the Zeo Sleep Manager and with the help of ZeoLibrary. One of the screenshots the ZeoLibrary takes every half hour while i am asleep. I use ZeoLibrary to record zeo data over the course of a night. The application shows the current frequency levels and raw brainwave data on top (still need to remove the 60Hz noise), and a recording of the frequency data and sleep-stages from the last half hour at the bottom. For easy readability i let the software take screenshots every half hour. To analyse the data, i then simply compare the recorded graphs and approximated average values for each of the frequency bins. The Zeo Sleep Manager groups recorded brain wave activity into seven frequency bins. The BETA3 bin overlaps in frequency with the ALPHA and BETA1 bin, and seems to be used for specific sleep spindle analysis. The frequency bin levels during deep sleep. Deep sleep stands out with the highest DELTA and THETA values. In addition the GAMMA values are very low. The frequency bin levels during light sleep. During light sleep THETA and ALPHA waves are at very similar levels and quite high, while the DELTA waves are considerably lower than in deep sleep. The frequency bin levels during REM sleep. In REM sleep, THETA waves are highest and GAMMA waves are slightly higher than in deep and light sleep stages. The frequency bin levels during the wake stage. When awake, the GAMMA values are at its highest, and the DELTA values at its lowest level. Overlapping display of all 4 sleep (and wake) stages. 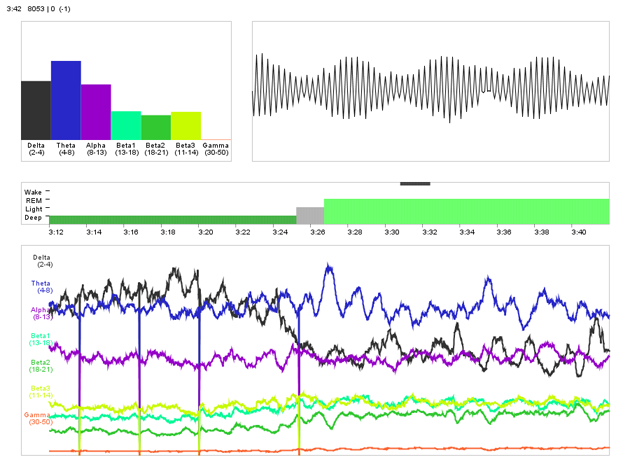 The images shows all four sleep stages – WAKE, REM, LIGHT and DEEP – as overlapped graphs. It shows that DEEP sleep reaches the highest levels in the low-frequency range, while the WAKE stage reaches the highest levels in the high-frequency range. The transparent blocks represents the change of level of the frequency bins between the four different sleep stages. The graph on the left shows the change of levels for each frequency bin, over the course of a full night (or full cycle through all sleep stages). Posted in Research and tagged 2012, brainwave, sleep, zeo, zeolibrary.